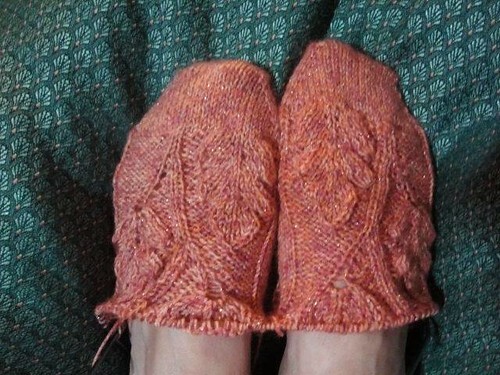 start of oak leaf stockings, originally uploaded by sunshine's creations. When I was a little girl I lived in the country on many acres of land with my grandparents. Recently that old home was torn down by the new owners sad but that is life. Parts of the house I grew up in were over 100 years. So it was a historical house that is no more. The property was full of real big beautiful oak trees that I loved playing under. 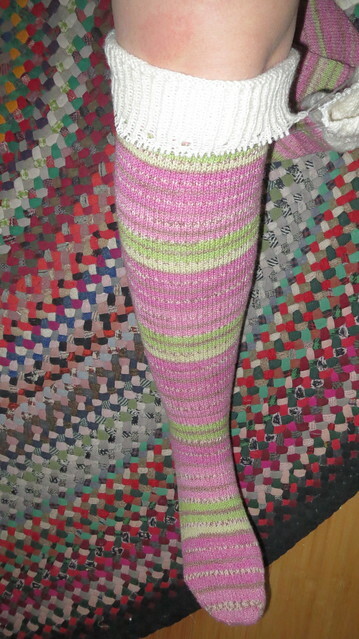 I am making these stockings in memory of those trees and the color I chose was a reminded to me of the bug houses that lived on those trees. It took me awhile to find a pattern for the oak leaves that I liked. Once I did find one it was in French and had some pretty unique symbols in it nothing like translating knitting from one language to another oi painful. 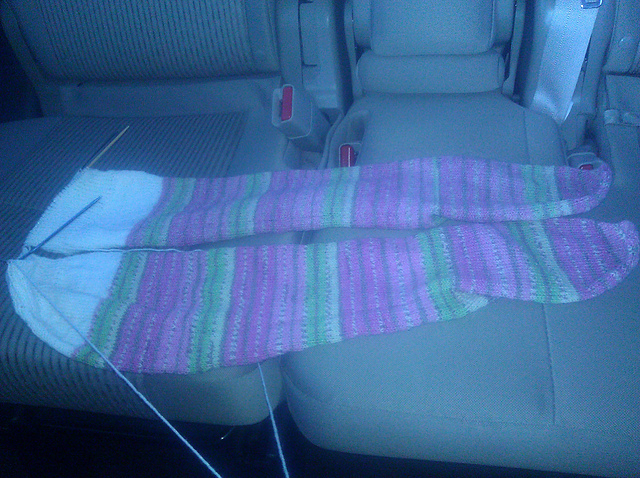 I had to frog these socks four times to just get to this point. 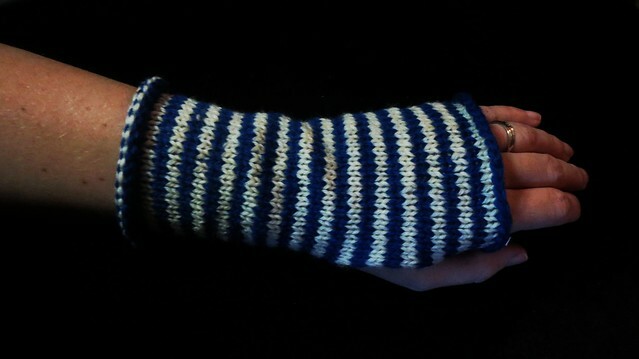 But now I know how to make this pattern and could not be more pleased with them. I have since found some other versions that incorporated acorns may add those to the back of the stockings or may make another set with them. The yarn I am using is Red Heart Stardust in orange (but the colors are actually orange with hints of red, yellow and purple). It is machine washable and discontinued. 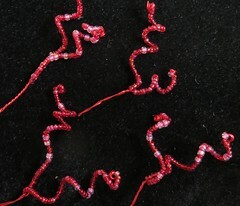 The fiber has a little sparkle in it too which I like reminds me of due on the leaves. Since I am incorporating multiple patterns together to make this item I hope it comes out OK as I am also winging it a ton too. Because my middle daughter wanted to make a pair. 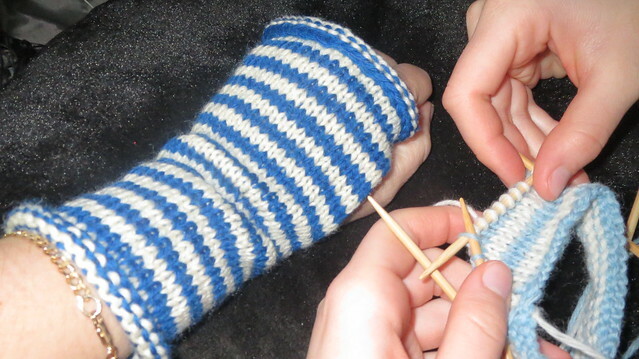 This is the daughter who said she would never learn how to knit. She said she only wanted the things I knitted but never would learn. At one time I convinced her to learn but she said she would never do it again. 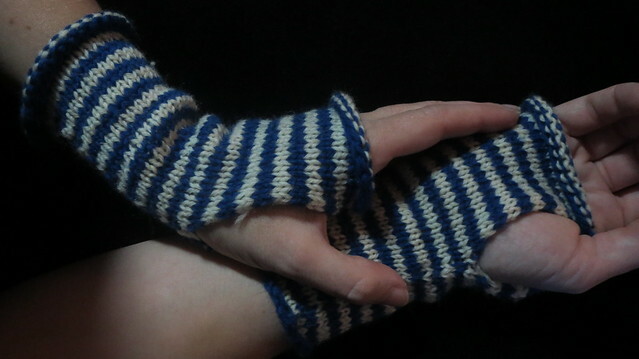 Imagine my surprise when she said she wanted a set of blue and white mitts for a costume she wanted to wear more surprised when she said she was going to knit them herself. So I am making a set with her. I went through the pattern to see any conflicts she might have with it as she is still a newbie. Supper simple pattern to follow and free too. I showed her how to cast on again and I did the cast off for her ( a loose cast off)Hers is light blue she is posting on her blog about them. Mine are dark royal blue with cream. In a few of my photos you will see the beginning of hers as we compared colors. She frogged her first glove three times before she liked it. I never frogged mine took four hours to knit both mitts for me. She is still working on hers. 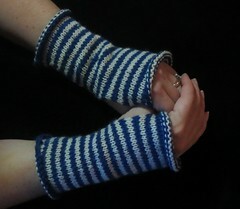 Another feature of the twisted knit stitch is that it has more texture than just the plain knit stitch. My daughters went to homecoming recently and I made a corsage for one and a boutonnière for the other. My middle daughter went stag as she is too young to date so I made her a corsage. She found her dress six months prior thrift shopping for 30 dollars not a bad price for such a dress. She modified the dress to be more modest with a shirt. 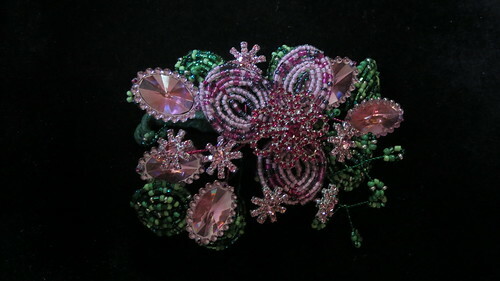 I used French beaded wire techniques to make this item. 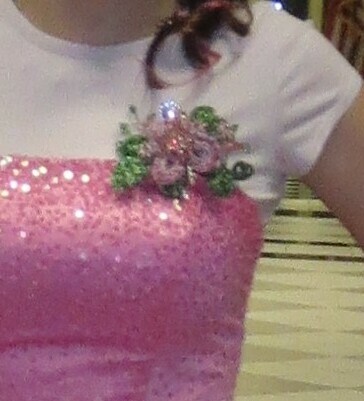 I also used pink rhinestone buttons and plastic sequins to make the corsage. The beads I used were beads left over from other projects that I had been collecting in color themes so I could make flowers out of them. 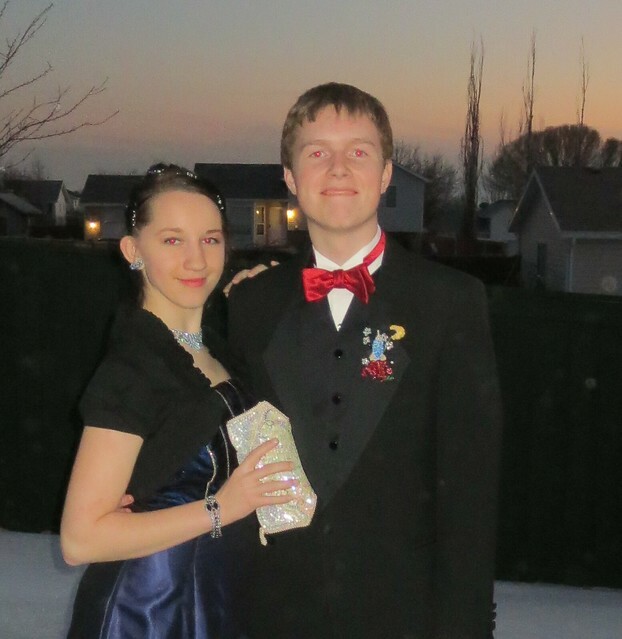 My oldest daughter went on a date the theme was starry night or some-sort of thing like that. 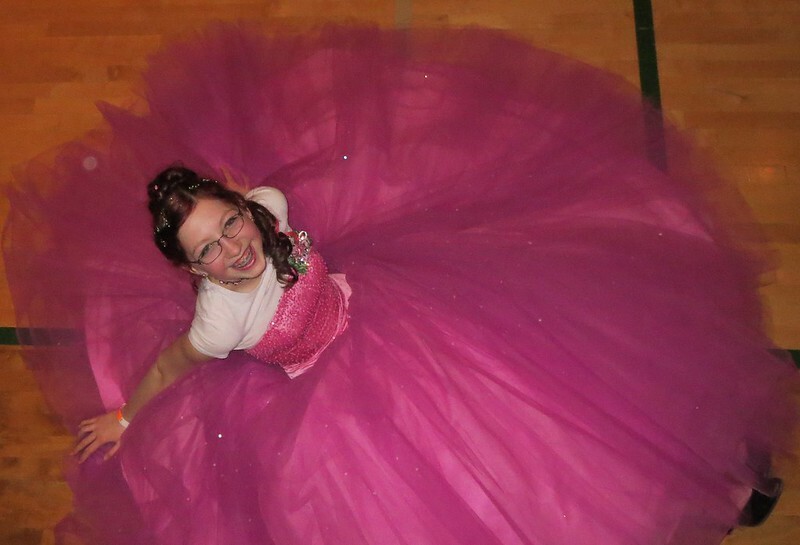 Her dress. I found thrift shopping for 10 dollars. 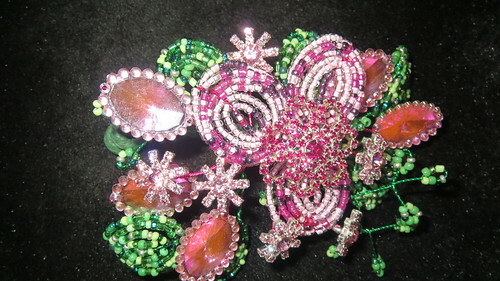 Her jewelry is rhinestone I owned as a child and the purse was her grandmothers. Last time it was used was in the 1960's to go to another homecoming dance. 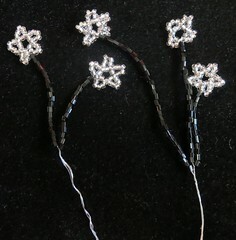 I made a beaded boutonnière for her date in the shape a rocket with stars, and a moon. My husband did a doodle and I made the boutonnière after his design as the inspiration. I used French beading techniques to make the stars and exhaust. 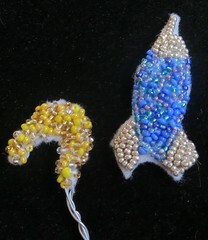 Wear as the rocket and moon I embroidered the beads on to apiece of felt then cut it out and stitched that on to a wire frame.